In early 2017, I wanted to connect students in Malaysia & the US to help make learning English more relevant to young Malaysians & share the wonders of multiculturalism in my moderate-Muslim-majority country with young people in the US. I considered all of the barriers for such an undertaking & figured that the best way to do this was to run a video exchange project targeting teachers as they would be able to provide mentorship & support to their students. 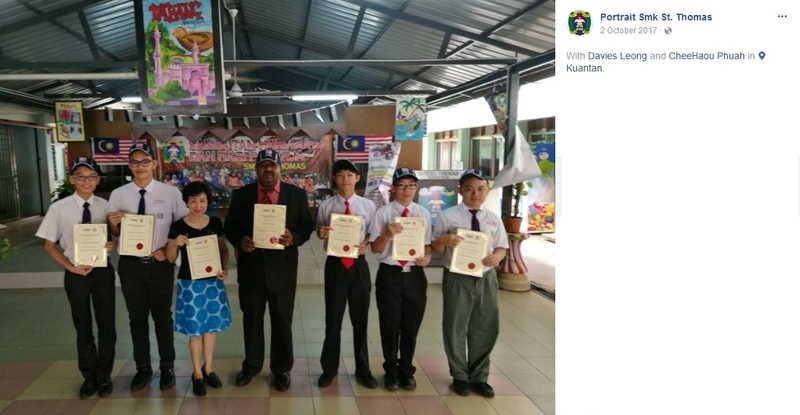 First, let me congratulate SMK St Thomas (Cikgu Khor), SMK Batu Lintang (Cikgu Ho), Youth Guidance (Mr Oommen), & Operation Breakthrough (Mr Rowles) for completing the project! In this blog post, I will share publicly available pictures & videos from the participants as well as what I have learned as the coordinator of the project. SMK St Thomas Team receiving their certificates & souvenirs. SMK Batu Lintang team receiving their certificates & souvenirs. The SMK Batu Lintang team describing what they learned from the project. The SMK St Thomas team describing what they learned from the project. 1. When running a program/project, consider the Pareto principle. The project was a peculiar manifestation of the Pareto principle. At the beginning, 25 teachers registered for the project. As I was about to make the pairings, only 10 teachers confirmed their participation. Out of 10, 4 completed the project while among those who did not, some were still able to exchange 1-3 videos. There were also a few who did not produce a single video. As novelty fades & priorities change, I expected attrition to happen, but I can't help but laugh when I realized that 4 is roughly 20% of 25. 2. Exchanges are like 2 hands clapping. Thus, what is the sound of 1 hand clapping? One reason for the high attrition rate was the need for a partner to carry the project forward. What happens when one side does not respond to any communications from the other? This would discourage the waiting partner & any self-respecting professional will eventually move on to another project. Every week, I followed up with each team via email. Sometimes I emailed more than once a week. Most of the time, I was ghosted me like an unrequited lover, desperately trying to connect albeit to no avail. When emails didn't work, I even tracked a few teachers down through Facebook, Twitter & Instagram. See how desperate I was? I'm glad I wasn't served with a restraining order! I really don't blame the teachers who have moved on. I completely understand that a teacher has to do 101 things at every second & this project was probably not high on the priority list. Isn't it strange how adults prefer to ghost? Than do the right thing, like say, withdraw. That's actually a completely viable & preferable course of action. 3. Reputable partners can fail you. As I wanted a certificate of completion of some substance for the participants, I partnered with Education Malaysia & MACEE as our goals were in alignment. 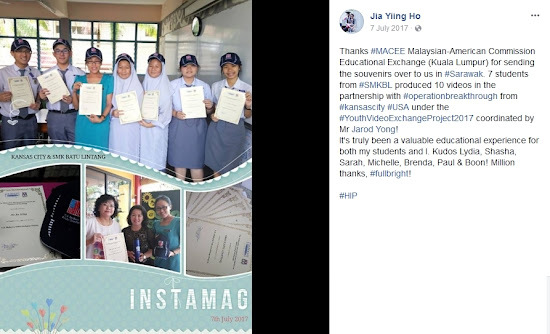 MACEE's goal was to promote educational exchange between US-Malaysia while Education Malaysia's goal was to promote Malaysia as a competitive study destination. Initially, both agreed to provide certificates & souvenirs to participants who completed the project. Would I do this again? Heck, yeah! Did you watch the videos embedded in this blog post? The students who participated in the project gained so much! That was my goal from the beginning. They learned about BOTH their own culture as well as those of their partners. Growth took place! I hope that the participants of the project will build on what they have gained & build more bridges (not walls) around the world. As technology gets cheaper & free web resources improve, such exchange projects will only become increasingly easier to facilitate. However, it's not something that a one-man-show like myself should attempt alone. I'll have to partner with like-minded teachers/supporters & work together. Together we can achieve more. Finally, I want to apologize for my personal shortcomings in the coordination of this project. I couldn't have done it without the patience & diligence of all of the participating teachers, students, school administrators, & parents. Thank you for making this project happen & I hope that we will continue to collaborate on bigger & better things!